Retta Scott (23 February 1916 – 26 August 1990) was an American artist. She is notable as the first woman to receive screen credit as an animator at the Walt Disney Animation Studios. Scott was born in Omak, Washington. She graduated from Seattle’s Roosevelt High School in 1934. She received an academic scholarship from the Chouinard Art Institute, so she moved to Los Angeles, California. She spent much of her free time sketching wildlife at the nearby Griffith Park zoo. Her ambition was to mold a career in Fine art. As she readied to complete her Institute training, the Institute’s director encouraged Scott to apply at Disney Studios. She was hired in 1938 and assigned to the Story Department, where the ambitious Bambi project was being developed. Her stunning sketches caught the eye of Disney himself, so when the film went into production she was assigned to animate scenes of hunting dogs chasing Faline. This was a significant coup for the young woman, since at the 1930s-era Disney studio, women were considered only for routine tasks: “Ink and paint art was a laborious part of the animation process, and was solely the domain of women . .” She worked under the film’s supervising director, David D. Hand, and was tutored by Disney animator Eric Larson. After Bambi, Scott contributed to Disney features Fantasia, Dumbo, and Disney’s version of The Wind in the Willows, which was shelved due to World War II and released in 1949 as part of the film The Adventures of Ichabod and Mr. Toad. In addition, Albert Becattini’s website of animator credits lists her as an animator on the 1942 Donald Duck cartoon releases Donald’s Snow Fight and Donald Gets Drafted, along with an unnamed Goofy short (1945). Retta appears on-screen in the Disney live-action studio tour film The Reluctant Dragon, alongside other Disney animators such as Wolfgang Reitherman in the portion of the film where Robert Benchley tours the Disney Studio’s life-drawing classroom (where the model that day happens to be an elephant). Retta presents Benchley with a caricature of himself as an elephant. She was laid-off from Disney during a periodic studio downsizing in late 1941, (partially as a result of the infamous Disney animators’ strike in the summer of 1941) but was rehired by the Disney Studio in 1942 to work in the Story Department. Retta Scott left Disney in 1946 and moved to the East Coast, where she continued to freelance, illustrating Disney publications such as the Big Golden Book edition of Disney’s Cinderella. She remained active as an illustrator for many years and returned to film animation with The Plague Dogs, directed by Martin Rosen, released in 1982. Around that same time in the early 1980s she also worked for the animation studio founded by Bud Luckey, The Luckey-Zamora Moving Picture Co. in the San Francisco Bay area. That studio later became a part of Colossal Pictures, and Luckey later became part of Pixar. 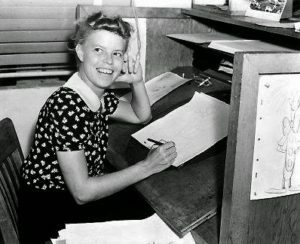 Some writers have occasionally confused Retta Scott with another Disney artist with the first name Retta, Retta Davidson, who worked at Disney from 1939 through 1966. Scott merited a chapter in The Little Big Book of Disney (“Retta Scott: Beauties and Beasts”, pp. 303–319) by Monique Peterson, and also a chapter in Walt’s People – Volume VIII (“Retta Scott”) by Didier Ghez. Retta Scott died at her home in Foster City, California on 26 August 1990.